We Have An Inspiring Heritage. Founded in 1727 by the Sisters of the Order of Saint Ursula, Ursuline Academy of New Orleans enjoys the distinction of being both the oldest, continuously-operating school for girls and the oldest Catholic school in the United States. Convinced that the education of women was essential to the development of a civilized, spiritual and just society, the Ursuline Sisters influenced culture and learning in New Orleans by providing an exceptional education for its women. An Ursuline education is rooted in a tradition of formation and innovation. It provides a nurturing environment for the learning and development of the whole person, based on a sound foundation of values drawn from the vision and philosophy of Saint Angela Merici, founder of the Ursuline Order in Brescia, Italy in 1535. Ursuline Academy is dedicated to the moral, spiritual, intellectual and social growth of each individual, and these values are validated by our educational approach. 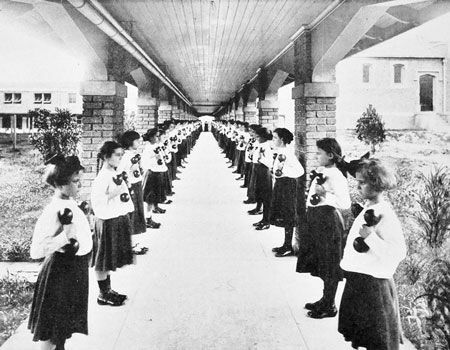 The Ursuline tradition holds many United States firsts in its dedication to the growth of individuals, including the first female pharmacist, first woman to contribute a book of literary merit, first convent, first free school and first retreat center for ladies, first classes for female African-American slaves, free women of color and Native Americans. In the region, Ursuline provided the first center of social welfare in the Mississippi Valley, first boarding school in Louisiana and the first school of music in New Orleans. We pledge our endless love today. Though life may lead us far away. Of all our hopes and dreams. Happy hours within your sacred halls. Ursuline Academy is one of three academies sponsored by the Ursuline Sisters of the Roman Union, Central Province. The Academy is also a member of Ursuline Education Network (UEN), a collaborative effort of the Ursuline congregations formed to carry their educational tradition into a new millennium. 1824 Ursulines moved from convent on Chartes Street to the Dauphine Street convent on the banks of the Mississippi, and there, Ursuline Academy continued without interruption. 2013 Fitness and Wellness Center opened. 2014 Pat Taylor Softball Field was completed.